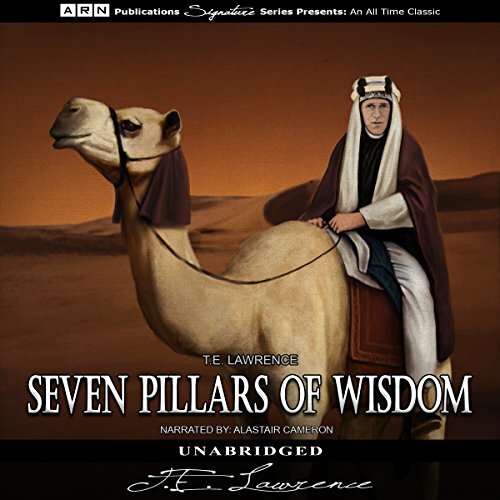 Seven Pillars of Wisdom is the autobiographical account of T. E. Lawrence's role in the Arab Revolt against the Turkish Empire. The book is mostly set in the deserts of Arabia with a great deal of time spent marching through them with camels and the telling of the events through Lawrence's eyes. Lawrence, educated at Oxford, began by working for a museum on an archaeological dig in the Middle East at the onset of World War I, after which he was commissioned into the British Army where is granted many military distinctions and special recognition for his achievements during the war years. Lawrence began not as a professional soldier but functions as an advisor to the Arab leadership and a liaison between the British headquarters and Hussein and his sons. Adopting the Arab garb at the suggestion of Feisal, he was accepted as one of the Arab leadership and became known as "Lawrence of Arabia" for his work in the revolt. After the war, the extraordinary and gifted man serves as an Arab consultant at peace conferences and as a political adviser to the colonial office of his government. A fascinating, thoughtful view of unconventional warfare from one of the legends of the field. ...to listen to. Reader is surely well-intentioned but his rhythm ia literally painful.too bad really. Eh... reader was hard to listen too. Would you try another book from T.E. Lawrence and/or Alastair Cameron? The performance was monotone. Very hard to listen too. I was excited to hear this classic but had to turn it off after becoming lost in an uninterested daze. It was fascinating listening to this historical figure tackle the same issues in the middle east our modern day soldiers face.